Golden Egg Games is running a Kickstarter for Athlas - Duel for Divinity, their new board game. They're already 2/3 to their goal, so be sure to check it out. 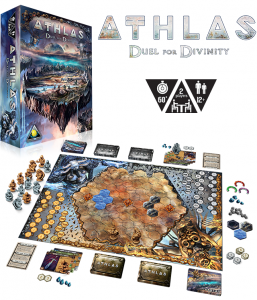 In Athlas - Duel for Divinity, each player takes the role of a young Athilian, a godlike being, outcast to the seven outer worlds to explore and uncover the secrets of creation laid by his ancestors. While traveling the outer worlds, Athilians practice their abilities to manipulate time and space until they become powerful enough to be challenged by the Athilian council to open the portal back to Athlas, thus passing the final test to adulthood. As an aspiring god you can design and create your own unique units by enhancing basic Genus cards with powerful abilities, artifacts and spells. You also get to choose divine interventions that might ultimately affect the outcome of the duel. Then you will summon your creations onto the battlefield and attempt to assemble two of three ancient relics in order to open the portal and win the game. The game’s limitless design system enables players to form any strategy they wish against their opponent’s creations.